Apparently there's no such thing as too young when it comes to teaching kids about technology. Soon available through Amazon will be the Vinci, a 7-inch tablet computer created especially for babies aged 0-4 years. 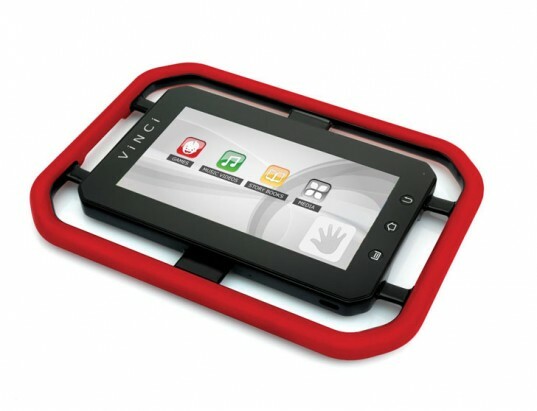 Retailing at $389, the Vinci is a comparable piece of tech that is both Android-based and features a real touch-screen. So what's the difference between a Vinci and an iPad? Supposedly, the Vinci is designed especially for the delicate bods of young babes, offering parents peace of mind in terms of both physical safety and content. It has a protective handle with soft, rounded corners created using the safest, non-toxic materials and the tablet can be parent-programmed, giving mom and dad the ability to control what their kids are seeing on the screen. But non-toxic or not, do we really think that exposing our children to tech and media at such a young age is such a great idea? Whatever happened to good old storytelling and imagination? Quite the leap from the Speak-and-Spell of our childhood days — and maybe even over some of our current PCs — the Vinci manages a Cortex A8 processor and 4GB of internal storage. There is even a built-in microphone and a 3-megapixel built-in camera to capture your kid calculating complex equations, probably before he or she can even say “computer”. However, unlike the competition, the Vinci does not have WiFi access. The reason for this is to avoid potentially harmful electromagnetic emissions, as well as to give parents assurance that their children don’t accidentally come across something unsavory on the web. The body of the Vinci is built to equally as health-conscious. The tablet comes in non-toxic packaging, and with a protective soft-corner case it is meant to last. The Vinci will be launched with 3 main educational components: games, music videos and storybooks. The games have been designed by Vinci are meant “to help parents and children explore, talk and learn together within a real world context”; the music videos to help children develop their cognitive and motor skills; and the storybooks will come complete with animations and sounds to encourage children to interact with the tablet’s touch-screen. The Vinci was designed by Dr. Dan D. Yang, a telecom entrepreneur who was inspired by her daughter’s excitement when playing with a smartphone. While the idea of adding yet another piece of tech into your life, let alone your child’s life, may seem almost too much, the company argues that the Vinci could be a powerful platform to help monitor your child’s development. The Vinci assembles suggestions and recommendations from experts in the field – pediatricians and developmental scientists – and uses this information to provide a comprehensive reference for your child’s growth from an emotional and intellectual perspective. You’ll not only be able to record precious moments, but check major milestones against the reference programmed in the VINCI to see if they’re on the right track. So would you buy a Vinci touchpad computer for your baby? Personally, we’ll stick to hard-cover storybooks and playgrounds in the park. Zero chance I'd purchase this product for my child. Just what the next generation needs: an opportunity to stunt social growth and development at an even younger age. Terrible idea all around - I think it'd be far more beneficial for the child to have a slow introduction to technology. The idea is to raise a well-rounded human being - how many times have I met children who can't even make eye contact or hold a conversation without pulling our their phones and nervously texting away. Quite the leap from the Speak-and-Spell of our childhood days -- and maybe even over some of our current PCs -- the Vinci manages a Cortex A8 processor and 4GB of internal storage. There is even a built-in microphone and a 3-megapixel built-in camera to capture your kid calculating complex equations, probably before he or she can even say "computer". However, unlike the competition, the Vinci does not have WiFi access. The reason for this is to avoid potentially harmful electromagnetic emissions, as well as to give parents assurance that their children don't accidentally come across something unsavory on the web. The body of the Vinci is built to equally as health-conscious. The tablet comes in non-toxic packaging, and with a protective soft-corner case it is meant to last. The Vinci will be launched with 3 main educational components: games, music videos and storybooks. The games have been designed by Vinci are meant "to help parents and children explore, talk and learn together within a real world context"; the music videos to help children develop their cognitive and motor skills; and the storybooks will come complete with animations and sounds to encourage children to interact with the tablet's touch-screen. The Vinci was designed by Dr. Dan D. Yang, a telecom entrepreneur who was inspired by her daughter's excitement when playing with a smartphone. While the idea of adding yet another piece of tech into your life, let alone your child's life, may seem almost too much, the company argues that the Vinci could be a powerful platform to help monitor your child's development. The Vinci assembles suggestions and recommendations from experts in the field - pediatricians and developmental scientists - and uses this information to provide a comprehensive reference for your child's growth from an emotional and intellectual perspective. You'll not only be able to record precious moments, but check major milestones against the reference programmed in the VINCI to see if they're on the right track. Would you buy a Vinci touch screen computer for your baby? Personally, we'll stick to storybooks and playgrounds in the park.